Riedel are one of the most recognised and leading glass manufacturers in the World. They pride themselves on high quality lead crystal glasses which enhance the flavour and enjoyment of the wine, champagne or spirit that you’re drinking. With over 15 different glass ranges, each has their own individual style designed different to meet the needs of today’s hugely popular wine drinking market. The Vinum range is Riedel’s benchmark, it features over 26 different glass types designed for specific wines, spirits, sparkling wines and much more. Each grape specific wine glass type is made from lead crystal and is machine-blown in Bavaria, Germany. Wineware are pleased to offer the most popular Riedel glasses in the Vinum range, all of which are currently on special offer. Get 25% OFF when purchasing two sets of two (4 glasses). This is one of the most popular and recognised wine glasses in the World. The Bordeaux glass sphere heads Riedel’s benchmark Vinum range as it’s used by top sommeliers and restaurants globally. Suitable for: Brunello di Montalcino, Cabernet France, Cabernet Sauvignon, Merlot, Medoc, Pomerol, Sangiovese and St. Emillon. This popular white wine glass is perfect for Chablis and Chardonnay, as well as a whole host of other tasty white wines. 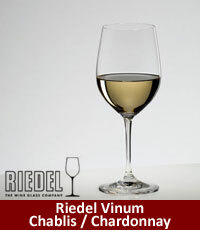 It’s been part of the Riedel Vinum range collection since 1986! Suitable for: Albarino, Burgundy (White), Chenin Blanc, Hermitage (White), Marsanne, Meursault, Montagny, Morillon, Pinot (Blanc, Gris) and Sauvignon blanc. 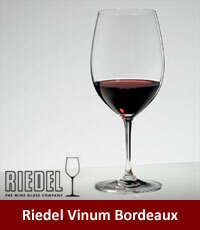 This is Riedel’s multi-purpose wine glass which can be used for both Red and White wine. It makes for a great tasting glass, but its grape specific for Zinfandel, Chianti and Riesling. Suitable for: Reds: Beaujolais Nouveau, Carignan, Chianti, Dolcetto, Dornfelder, Grignolino, Lambrusco, Patrimonio, Rose, Teroldego, Trollinger, Vernatsch and Vin de Corse. Whites: Alsace, Chenin Blanc, Patrimonio, Semillon, & Vouvray. 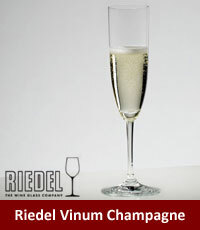 The Champagne glass from the vinum range allows you to watch the bubbles race from the bottle to the top in style! Part of the vinum range since 1986, this champagne flute still looks and feels elegant today. 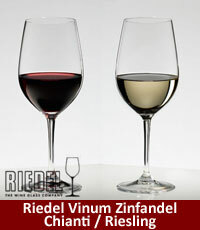 Click here if you would like to know more about the Riedel Vinum range. Send us a tweet expressing how much you love your Riedel glasses or a photo of you using them!